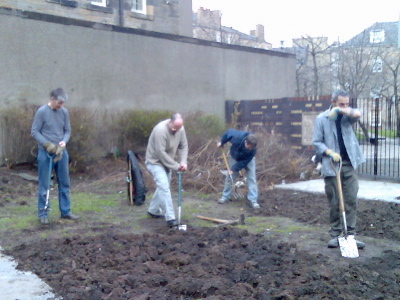 Groundbreaking work at Persevere Community Garden, thanks to Mary Moriarty whose appeal at the Port O’ Leith produced some very welcome voluntary help. Thanks to Mary Moriarty we had excellent help to dig the toughest plot at Persevere Community Garden on a grey Saturday afternoon. After spotting our appeal for help in the last Leith Open Space newsletter, Mary put a notice in her Port O’Leith bar asking for volunteers (adding ‘bring your own spade’ ). The following week Christopher Webb and Kinnon turned up with spades (and buckets of energy) to help Ray, Nick and myself turn over the challenging first plot. “Last time I was in here it looked very different,” was Christopher’s comment looking at the site he remembered from primary school football games. During the afternoon he developed his own athletic approach to digging the hard ground: using the spade as a kind of pogo stick proved to be very effective at breaking through clay and concrete! Despite the hard work of all the voluntary groups (Greener Leith, Green Seeds, Persevere Community Flat and Leith Open Space) there is much more preparation to do before we can start planting veg. 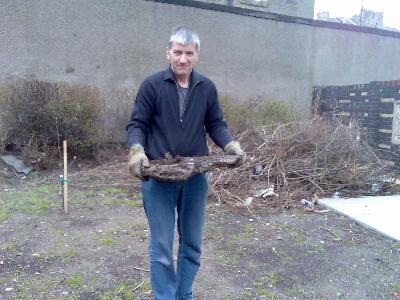 But Alastair Tibbitt of Greener Leith is organising a delivery of topsoil and Councillor Gordon Munro is helping to chase up a load of compost. So Leith Open Space has invested in a nice bag of main crop potatoes to plant once we have removed all the stones and lumps of cement. So keep watching this space…and get in touch whenever you feel like a bit of healthy exercise!